What do gardening and weddings have in common? Tulle! 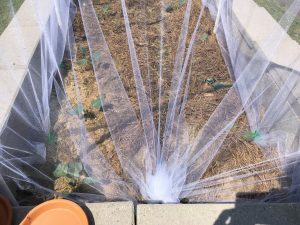 In a previous post, I talked about my challenges with growing squash and defeating squash vine borers who are constantly plotting the demise of my squash plants. 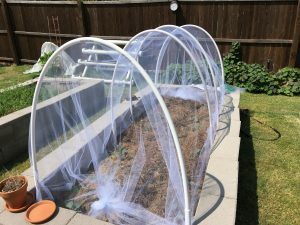 I heard from several people that protecting those squash plants with tulle (the netting often used in bridal veils) worked really well to keep the pesky creatures away. So, I fired up Amazon and ordered a bolt of 104″ wide tulle. As far as the broccoli, every time I’ve planted it I have had problems with what I think are cabbage moths laying eggs, then the bright green worms eating the leaves on the plants and killing some of them. I’m hoping the tulle will keep the moths from laying eggs on the plants. I’m very excited to see how it will work. Everything I read says that the tulle allows light and moisture through, but not bugs. It also seems to be long lasting. Also, quite unlike bird netting, it doesn’t “catch” on itself and become a jumbled mess. Another thing is that the openings aren’t big enough for the plant to grow through, so you won’t rip up the plant when you remove it. Seems like a homerun to me. 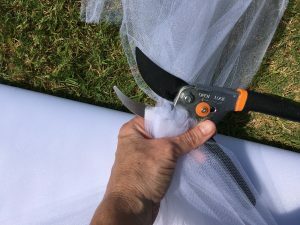 I’m guessing people who make wedding dresses don’t use bypass pruners to cut their tulle.